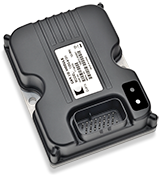 The Curtis Model 1353 CANbus I/O expansion module provides additional I/O capabilities to any CANopen vehicle control system. It allows accurate control of up to 9 proportional hydraulic valves, or can be used to expand a system’s digital and analog I/O. Typically used on materials handling trucks, aerial lift platforms, airport ground support equipment, compact construction equipment and sweeper-scrubber floor care machines.